When we tested a bunch of Danish CEOs on whiskey pricing, the real question was whether they could resist the so-called anchoring bias. So, how well did they do? Typically in a field experiment, our aim at iNudgeYou is to observe and map the behaviors of regular people while they interact with their complex surroundings. Everywhere from conference buffets to the airport, we’ve been busy using this guerrilla research approach to pinpoint which nudges are effective at promoting behavioral change, in the interest of citizens and society alike. In running such experiments, one bedrock assumption is that the observed sample should mirror the wider population of interest. Otherwise, if the sample turns out to be unrepresentative, the responses given and patterns spotted could amount to a mere fluke. To combat this risk, we almost always try to obtain large samples whose makeup reflects the population in question. However, in early 2013, we jumped at a rare chance to get our hands on an fascinating sample. Rather than monitor or survey people assembled naturally in a given public setting, we managed to zero in on a specific, elite, and highly elusive target: CEOs of Danish firms. Why focus on this group in particular? What was the nudge, and did it work as expected? Most importantly, how might any of this matter? Like its name suggests, anchoring refers to a phenomenon that easily sinks in and that resists attempts at being lifted. In a landmark 1974 paper, renowned psychologists Daniel Kahneman and Amos Tversky – the former a Nobel Prize winner – identified anchoring as one of the heuristics, or cognitive shortcuts, that can speed up decisions but also make them less than optimal. The anchoring effect is said to occur when initial exposure to some piece of information carries an excess influence on a later judgment. Anchors, often in the form of a numerical value, might be implausible or totally unrelated to the question that follows. Even so, studies (nicely compiled in this review) provide consistent evidence that judgments tend to move toward an anchor once it has gripped someone’s mind. And this represents a systematic violation of rational thinking. Perhaps the most famous illustration of anchoring comes courtesy of Kahneman and Tversky, with their use of a rigged roulette wheel. The wheel was programmed to land either on a high or a low number: 65 and 10, respectively. After making a spin, study participants were asked if they believed their number was higher or lower than the proportion of African member states in the UN. Finally they had to guess the exact proportion. The findings showed that individuals presented with the higher anchor also made higher estimates on average. The median estimate was 45% for those who had landed on 65 earlier, compared with 25% for those exposed to the lower value of 10. Accounting for this gap of roughly 20 percentage points, the authors concluded, was the anchors’ lingering influence on what should have been a separate analytical task. In the decades since, anchoring has been investigated in various contexts and probed extensively for associations with mood, personality type, and cognitive ability. Many studies go so far as providing a monetary incentive for accurate estimates, but even they infrequently reduce the presence of anchoring. While there is still a debate as to what causes anchoring, the standard anchoring effect is generally agreed to be a special case of semantic activation (namely priming). Less clear is whether anchoring holds for real-world deliberations as much as it has been exposed under purposefully artificial laboratory conditions. The effect might be less pronounced – or overcome entirely – if people have sufficient time, access to full information, and a well-defined personal stake in the judgment they’re asked to make. Some research has addressed if experts might be vulnerable to anchoring as well. Conventional wisdom holds that experts, as exemplified by CEOs, are both familiar with the relevant information and accountable for the consequences of their decision-making. Therefore they shouldn’t be as readily and helplessly swayed by the first number tossed out, for example, in a boardroom negotiation. But is it actually the case that CEOs can resist? Enter our field experiment. Relatively unique to the experiment we’re about to describe is that it tested anchoring on very high-skilled individuals; it was carried out in a naturalistic setting; and it used conceivably accurate values as the anchors. The point was not to examine if a bizarre value from a whole other domain, like in the wheel-spin experiment, would throw off the CEOs guesses. Instead we were curious as to whether plausible, context-appropriate anchors exert a guiding force on knowledgeable people, routinely used to snap decisions. In early 2013, some of our researchers learned about a conference that brought together about 500 of Denmark’s CEOs. We saw this as a unique opportunity for a series of experiments with CEOs. For this experiment, we got approval to stand in wait inside the venue and flag down CEOs as they trickled out of a dinner – sorry for the pun coming up – in piecemeal fashion. Our intervention consisted of getting price estimates from CEOs following their exposure to anchors. 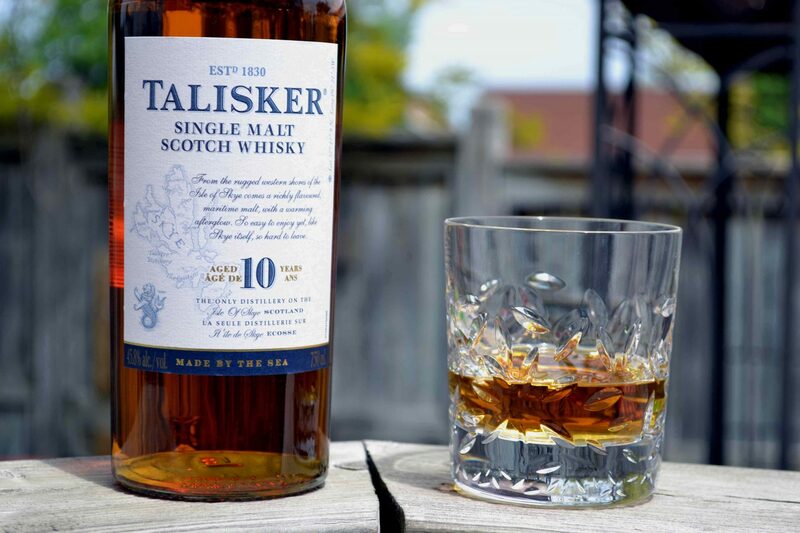 A bottle of Talisker whiskey served as the basis of these CEOs’ estimates. The experimental procedure was modeled after the one first developed by Kahneman and Tversky and adapted many times over. With a sample size of 75 CEOs, we recruited at least as many people as is the norm for these types of studies. The CEOs were assigned to one of two treatment groups quasi-randomly, in alternating order of when they emerged from dinner and agreed to join the study. Every participant was told an anchor at the start of the trial: a high value for one group and a low value for the other. Stated in terms of prices, the anchor values were either 200 or 600 kroner (about $33/£21 or $100/£68, respectively) depending on the treatment condition. The varying anchors are assumed to represent the only significant dimension by which the groups measurably differed. 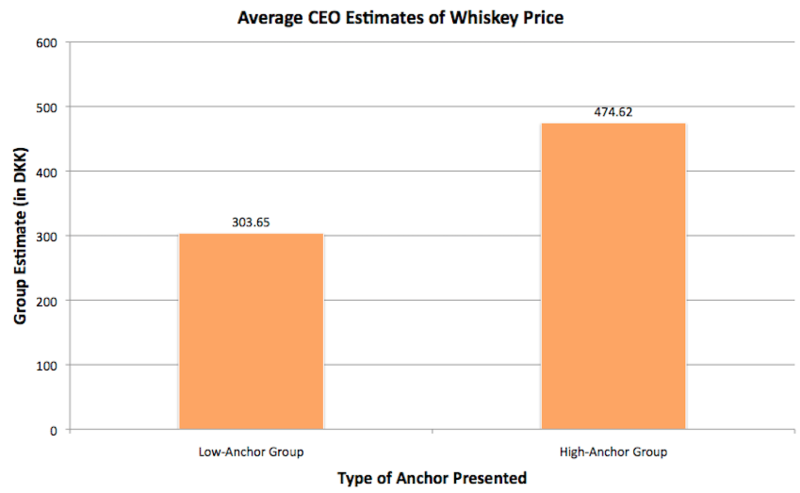 After being told an anchor and shown the whiskey bottle at the heart of the experiment, the CEOs next faced a binary question: Do you think the price of that bottle falls above or below the value you just heard? Then the CEOs were asked to provide their own estimates of the whiskey’s selling price (around 379 kroner as of last year). There was a striking difference in the average estimates between the groups, consistent with previous experimental results on anchoring. Whereas the high-anchor group (n=37) guessed at an average of 474.62 kroner, the low-anchor group (n=38) centered their estimates on a price of just 303.65 kroner. This difference of about 170 kroner was determined to be significant at the 95% confidence level. Our results suggest too heavy a fixation on a starting reference, here the anchor supplied, even if it lacks accuracy or saliency for a decision later on. To be fair, anchoring (and many other heuristics) might operate as a sort of protection against mental overload. If possible input at our disposal received a share of our attention, this argument goes, then our decisions risk coming to a standstill amid the competing noise. From an opposite perspective, the danger with anchoring lies in potentially shielding people from relevant information. Just as Northcraft and Neale (1987) established for a sample professional real-estate agents, a number of Danish CEOs in our study appear guilty of letting an anchor unduly affect their thought process. (Not to worry, we aren’t keeping track of any names!) This can translate into minor overspending, like on a bottle of whiskey, or perhaps more serious errors in the context of business negotiation. The major takeaway here isn’t that CEOs are so rich that they neither follow nor care about prices. Rather it’s that the anchoring bias doesn’t discriminate as far as its victims. Even Danish CEOs can fall prey to judgment mistakes.